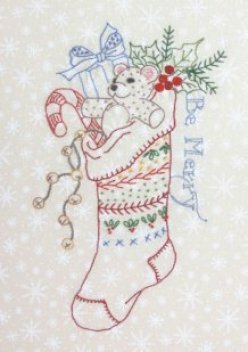 A vintage Christmas stocking brimming with gifts and goodies! Pattern is for the 6”x 10” image only. 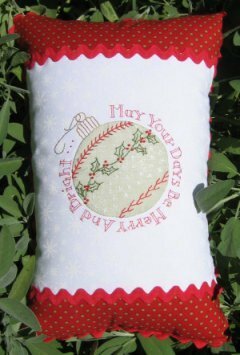 This little 9” x 14” pillow brings tidings of cheer for Christmas! The appliquéd ornament is embellished with embroidery and the rickrack-trimmed pillow sets it off to a tee! 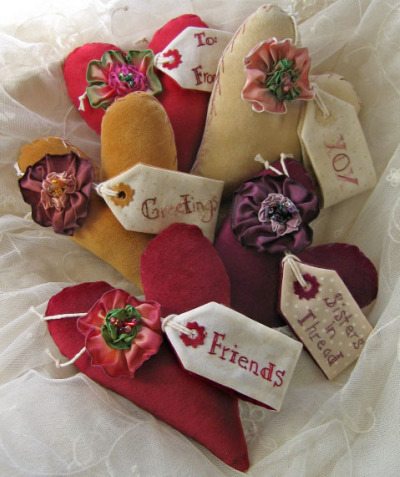 Meg Hawkey, designer and owner of Crabapple Hill Studio, was born and raised in Washington State. She, her husband (and a big yellow Cat named Honeybunny) live near the Tri-Cities area not too far from the Washington/Oregon border. Meg has been sewing, crafting, knitting, gardening and cooking her whole life. While raising her son (now full grown) she was a cake decorator by trade and segued into the pattern business by happenstance... While working part time for a local quilt shop, where she was in charge of laying up the shop’s newsletter, she started drawing doodles and images in the open spaces to dress it up. 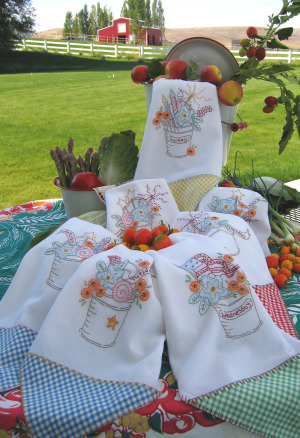 After customers started requesting the drawings to embroider, Meg began designing patterns for the shop. 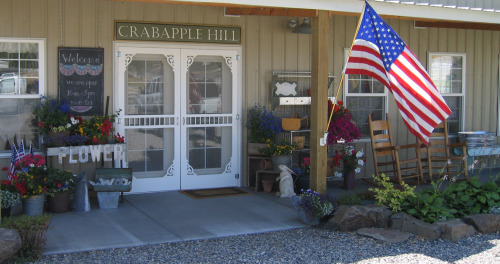 Later she decided to start mass producing her own patterns and Crabapple Hill Studio was born! If you ask Meg what kind of things are important to her she will almost always respond the same way ...family, friends, making her surroundings pretty, creating beauty any way possible, and remembering to enjoy what you’re doing and not stress about perfection! I’ve been sewing, knitting, crocheting and embroidering for as far back as I can remember. 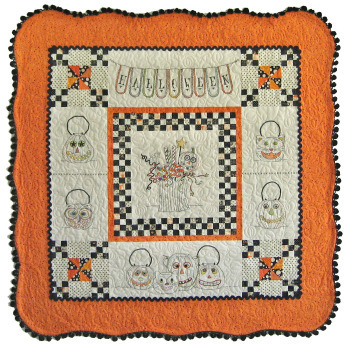 When I was a child, I started to make doll quilts. I made my first bed quilt when I was 16 (the fabric was the birthday present I’d BEGGED for)! 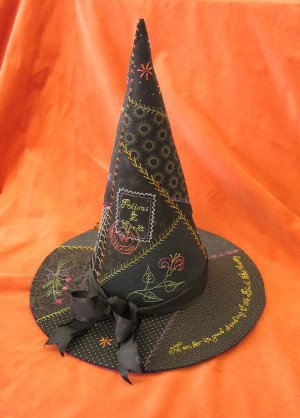 After that, as with any other quilter out there, I was hooked! I like to make things pretty. 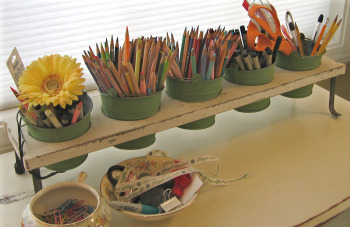 That can be actually “making things” or gardening, or home decor, or cooking....or searching for vintage stuff ! 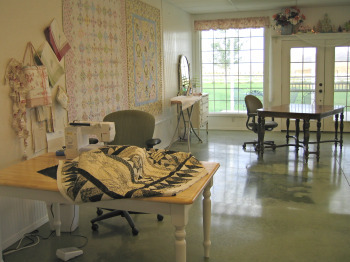 Years ago, when I worked at a quilt shop, I decided to take a mystery quilt class on the spur of the moment. Someone I worked with helped me out by cutting my fabrics for me (batiks...beautiful!) and cut most of the strips the wrong widths. I sat through the class - stretching the fabric to zip it through the machine without a care in the world because in my mind it was already ruined & what did it matter? I was just there to have fun anyway! I learned a huge lesson... the quilt turned out just fine...none of the points were absolutely perfect but it all “quilted out”. I still have that quilt & love it & use it! It’s very freeing to know that you don’t have to produce perfection. I’ve been married for...let’s see...32 years? (YIKES) to my husband who is still nice enough to go along with all of my projects and adventures without complaining TOO much. We have a grown son who has just turned 31...which really hurts my feelings because that means I’m old! Both my husband and my son have refused to learn to embroider...go figure! What other interesting things do you have going on right now? 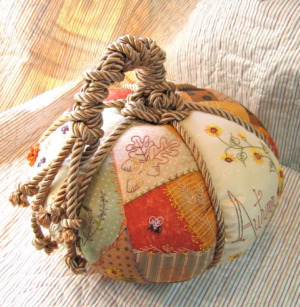 We’re going to start having seasonal Stitchery Sojourn Retreats in the studio starting this fall. Our retreat in October is already full...YAY! Do you like Meg's designs?